Unit Yo likes to bring us rising talent from the Czech Republic, and this video of Luka Pokorny definitely fits the bill. Smooth tricks and plenty of promise. Yoyo used is the C3yoyodesign Level 6. Lukas Pokorny shows off some nice trick construction in this video. More talent from the Czech Republic! 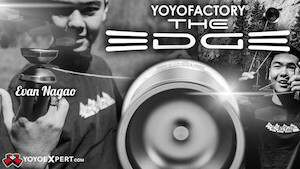 Yoyo used is the Speedaholic by C3YoYoDesign. Check out this crazy blacklight yoyo video from the Czech Republic featuring some great tricks by Tomáš “Kogy” Vondra, Tomáš Dvořák, Michael Malík, Lukáš Pokorný, Pavel Dietrich, Kryštof Kindl, Ráfa Dvořák, and David Stejskal.